This performance has been broadcast by the BBC at least once, probably twice, over the last decade or so. It now takes its place in the BBC Legends series and is thereby given permanent form on disc. We all know Beecham’s waggish Beethovenian pronouncements about the Seventh and the Choral but the Ninth wasn’t the originally intended work to be performed at the Edinburgh Festival in August 1956. As Graham Melville-Mason notes, that was the Missa Solemnis but a performance of a Catholic Mass on the Sabbath was anathema to the Presbyterian Church of Scotland, which duly objected. Hence the Ninth. 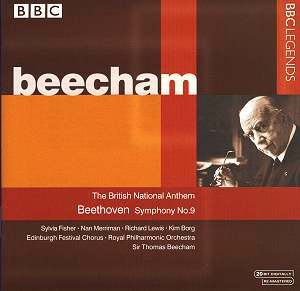 It’s certainly an illuminating and so far unique experience to savour Beecham in a work not associated with him – though it’s often the case that works “not associated” with him turn out to have been buried in his repertoire at some point during his long career. I wrote about just such a work, the jinxed Missa Solemnis, in its appearance on Somm (see review) and that really was a revelation; the then earliest surviving broadcast or recording of the work live from the 1937 Leeds Triennial Music Festival. That was, as I wrote at the time, an incandescent and deeply moving reading and it attested to the conductor’s exceptional skill in marshalling solo and choral-orchestral forces, and not least a deep perception into the workings of the score. There are no comparable revelations in respect of the Edinburgh performance. The reading is finely paced in broad outline, has moments of indisputable grandeur and magnificence, and certainly belies the conductor’s reputation as a poor symphonic Beethoven conductor. But there are no real indications of any transcendental qualities in the reading. That said the first three movements are really splendidly done. The high point is probably the opening movement itself which Beecham vests with tremendous power and authority; rhythms are sharply etched and drive on the symphonic argument. His orchestra plays with real panache and authority and the Scherzo – not at all too fast, really quite measured – is a study in cumulative power. The slow movement is revelled in, lovingly unfolded – too much so perhaps at various points. The finale brings one inescapable problem; the singing. The Chorus is uncharacteristically undisciplined. I don’t know how many rehearsals they’d been given but from the sound of it not nearly enough. Their sound spreads badly and they’re not always in tune. Kim Borg was in a bit of a hectoring mood that day and Nan Merriman is a bit squally. Richard Lewis sings well, the best of the quartet. As for Beecham this movement tends to encourage him to variable pacing. He doesn’t dig into the fugal passages and can let others rather drift. I wouldn’t suggest that it’s a bad performance of the finale but I would say that it’s a disappointment after the three earlier movements. No one conducted the National Anthem like Beecham. Here though we have Elgar’s choral version, which is grand but not exciting. The constituency for this will be Beecham admirers and the like. The performance is, as I’ve noted, memorable in places but strongly flawed as well. But as Beecham himself might have added; better out than in.